The Visual Understanding Environment (VUE) is a concept mapping tool that integrates digital resources into teaching and learning. 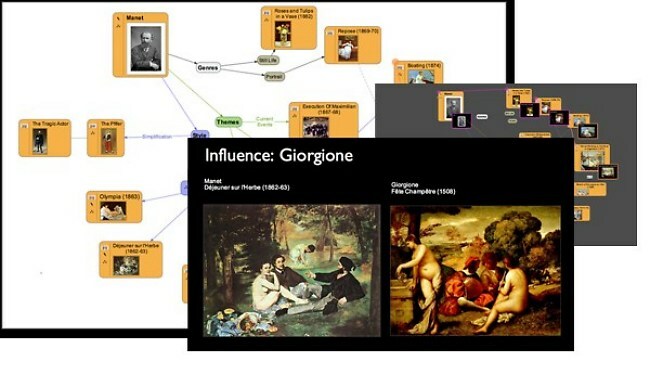 It allows users to build presentations based upon their concept maps. It also supports federated searching against many different data sources including MFA, JStor, ArtStor, Google, Yahoo, PubMed and others. I use VUE with voice recognition, and it responds, including shortcut keys. Its ability to separate different modes of working (nodes, links, text), add labels to links, place text notes, embedded nodes within nodes, and work in different layers, makes it the professional’s choice. The Visual Understanding Environment (VUE) is the best in all ways for me!!! Pdf can’t be made and zotero is only for Firefox browser (i’m using opera and webkit). VUE is a terrific programme, which has been developed by researchers at Tufts University. It is mainly aimed at students and academic researchers, but could be used by anyone who wants a visual way of organizing thoughts. I would tend to consider it a concept mapping tool rather than an mind mapping tool, as it can be used with repository collections or research data collected by the user (it has a nice little add-on which imports Zotero bibliographies). I have found it really valuable for helping to make sense of a collection of notes on a topic and seeing where the connections and links are. This allows you to make mind maps with no restrictions on the placement of any nodes (as compared to MindManager etc). Unfortunately interactive PDF (such as in MindManager) cannot be made.